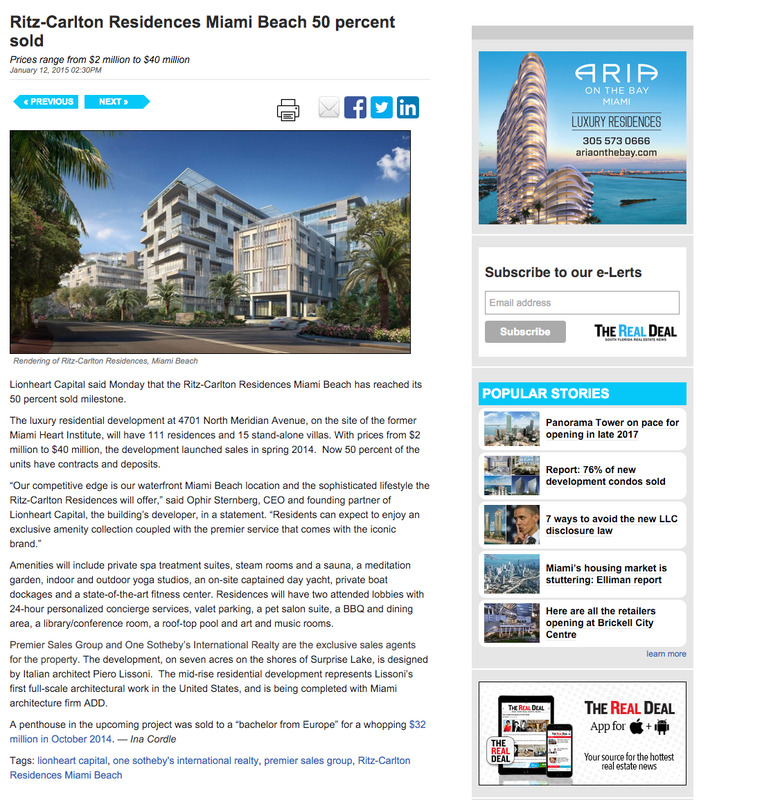 Lionheart Capital said Monday that the Ritz-Carlton Residences Miami Beach has reached its 50 percent sold milestone. Amenities will include private spa treatment suites, steam rooms and a sauna, a meditation garden, indoor and outdoor yoga studios, an on-site captained day yacht, private boat dockages and a state-of-the-art fitness center. Residences will have two attended lobbies with 24-hour personalized concierge services, valet parking, a pet salon suite, a BBQ and dining area, a library/conference room, a roof-top pool and art and music rooms. Premier Sales Group and One Sotheby’s International Realty are the exclusive sales agents for the property. The development, on seven acres on the shores of Surprise Lake, is designed by Italian architect Piero Lissoni. The mid-rise residential development represents Lissoni’s first full-scale architectural work in the United States, and is being completed with Miami architecture firm ADD.